On average, about 50 tornadoes occur in Florida every year mostly in the spring and summer season. Although the Midwest is best known for severe tornados, the southern region of the U.S. is also prone to tornadoes. With winds typically ranging between 65 mph and 200 mph, these natural disasters can cause extensive damage to property in only a few seconds. Often tornadoes accompany thunderstorms and hurricanes as cold and warm weather systems collide. An “Enhanced Fujita” (EF) scale is used by the National Weather Service to rate tornadoes, based on the speed of a three-second wind gust. Measurement begins at a minimum of 65 mph (EF = 0); tornadoes with an EF rating of 5 are in excess of 200 mph (EF = 5). Weather forecasters distinguish between tornado watches and warnings, just as they do for hurricanes. Take cover right away if there is a tornado “warning” in your area. Unlike hurricanes, there is often little warning if a tornado is heading your way. The National Oceanic and Atmospheric Administration (NOAA) recommends purchasing an all-hazards weather radio for your home or business to use for monitoring both non-weather and weather-related concerns. Develop an emergency plan for your family, and be sure to include tornadoes on your “What if…?” list. If you already have a plan in place, take the time to review it each year to make any needed changes. Then practice, practice, practice! Did you know…? The average lead time for a tornado warning is only 13 minutes! 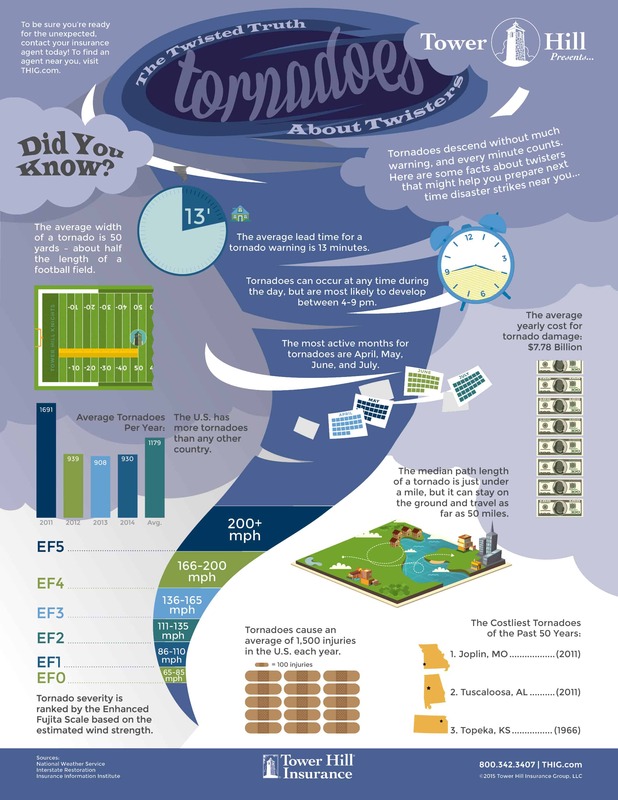 To learn more, take a look at our infographic: The Twisted Truth about Twisters! For tornado safety tips, check out one or more of these helpful websites: American Red Cross, Weather Channel, and How Stuff Works.